It is the fruit that inspired one of Britain’s greatest ever scientists, Isaac Newton, to formulate his “theory of gravitation”, and many of us would regard the apple as a quintessentially British fruit. A generation or two back it truly was, but over the past 40 years nearly two thirds of all UK apple orchards have been lost, and more and more traditional varieties of this fruit face extinction. Nowadays we import most of the apples we eat and 85% of all apples sold in the UK last year were purchased from supermarkets. The two most popular varieties sold by the supermarkets, Gala and Braeburn – which together account for nearly half of all our apple purchases – are imported from New Zealand, some 11,500 miles away. The supermarkets claim they are simply providing what we consumers want, but the truth is they provide what is most convenient for themselves – a year round supply that can be transported and stored for long periods, an apple that is consistent in shape and colour and which provides a good profit margin. Taste is secondary to these other requirements. Britain’s dwindling numbers of small scale orchards may still produce wonderful tasting apples but because these apples are seasonally confined to a few months per year and because they are sometimes imperfectly shaped they continue to lose out to cosmetically attractive apples grown on an industrial scale in countries like New Zealand and the USA. Unless you are fortunate to grow rare heritage varieties of apples in your own garden or on your allotment you’ll probably have to visit one of these dwindling number of British orchards or perhaps go to Brogdale Farm, near Faversham, Kent, home to the National Fruit Collection, to see many of them. 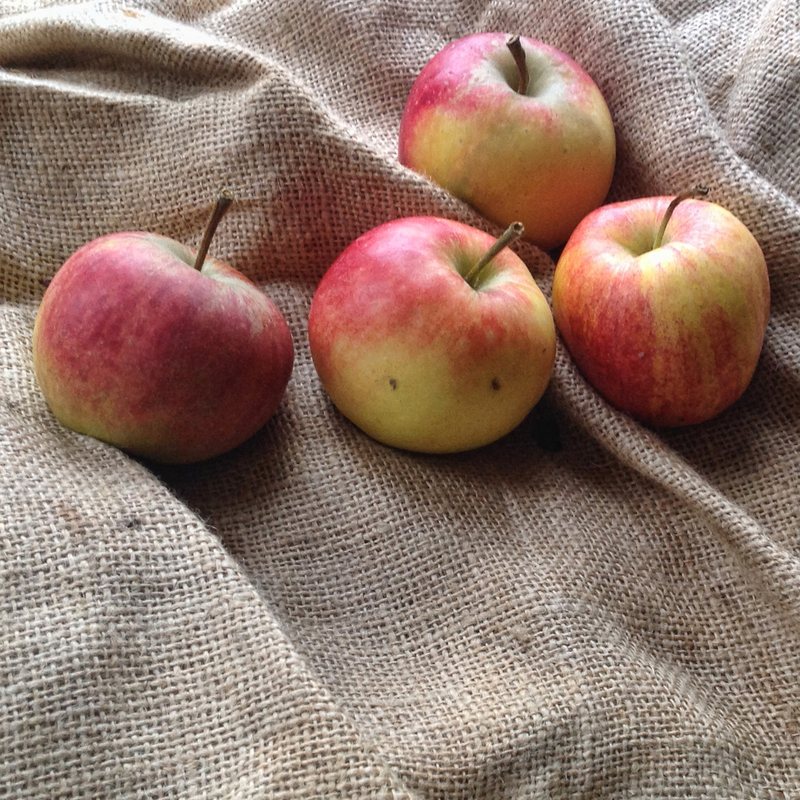 At Brogdale you can find once revered but now rare varieties of apple such as Barnack Beauty, Gascoyne’s Scarlet, Peasgood’s Nonsuch and Lord Lambourne. There are still 2,200 varieties of apple in Britain, many of them exceedingly rare. Someone once pointed out that if you were able to track down one of each variety of these English apples you could actually eat a different apple every day for over six years. Compare that to the endless, bland cycle of Gala and Braeburn at the heart of the “choice” the supermarkets have contrived to present to us. OK, Time for a seasonal recipe. Kringle is a centuries old Scandinavian pastry. Traditionally it was shaped like a large pretzel but over the generations it has evolved and diversified in shape. In Wisconsin, for example, it has an oval shape (Wisconsin has a thriving American-Danish culture and is renowned for its kringle pastry) whereas in Estonia kringle comes in the form of a beautiful wreath-like circle. This is my version, which I suppose could best be described as a cross between a kringle and a Danish pastry, pairing a Wisconsin-style kringle dough with an apple and cinnamon filling and cinnamon drizzle icing. For this recipe I used Elstar apples, sourced from an orchard in Ledbury, not far from where I live, but any locally-sourced eating apple will do. I think kringle makes a superior seasonal alternative to the ubiquitous mince pie. Although it does take a bit of time to make (meaning an element of planning ahead), much of the time revolves waiting for the dough to chill at key stages, so you can be doing other things (reading the paper, walking the dog, wrapping Christmas presents, etc) while that happens. The long wait is so worth it. 1. Place the block of butter between two rectangular sheets of baking parchment. Use a rolling pin to slowly roll out the butter to a thin rectangle. Place this in the fridge for 30 minutes. 2. Dissolve the yeast in the lukewarm water and leave for 5 minutes. Place the flour in the bowl of a food processor. Add the yeast and water mixture, the lukewarm milk, caster sugar, egg and salt. Process, using a dough hook attachment if you have one, until the mixture forms a smooth pliable dough. Knead this dough for a further 5 minutes. Remove from the bowl, wrap in cling film and place in the fridge for 30 minutes while you go off and have a cup of tea. 3. Remove the dough from the fridge and roll out on a clean floured board or work surface into a rectangle approximately 30 cm by 20cm in size. Take the thin sheet of butter from the fridge. Cut it in half, and return one half to the fridge. Place the other half sheet of butter in the centre of the rectangle of dough. Fold the pastry over the butter sheet and press down lightly with the rolling pin before wrapping the dough back in the cling film sheet and returning to the fridge for a further 30 minutes to chill. 4. Remove the chilled dough from the fridge. Carefully roll it out, as before, into a rectangle measuring approximately 30cm by 20cm. Remove the remaining sheet of butter from the fridge and place it in the centre of the dough rectangle. As before, fold the pasty over the butter and press down lightly with the rolling pin before wrapping the dough back in the cling film sheet and returning to the fridge for a further 30 minutes to chill. 5. Carefully roll out the dough into a rectangle, the same dimensions as before. Fold one third of the dough over the centre third, folding the remaining third over the top. Press down lightly with the rolling pin, wrap in the cling film and refrigerate for another 30 minutes. 6. While the dough is chilling again, prepare the apple filling. In a food processor bowl add the butter cubes, muscovado sugar, sea salt and cinnamon. Process until the mixture becomes smooth and creamy. Remove the bowl from the processor, add the apple cubes and mix by hand to combine thoroughly. Set to one side. 8. Remove the block of dough from the fridge and cut it in half lengthways. Take each portion of the dough and roll it out carefully into a long thin rectangle, approximately 10 cm in width. Now place a line of the apple and cinnamon filling lengthways down each strip of dough, placing the filling in the middle third of the strip. Fold one third of the pastry over the filling. Brush it very lightly along its length with the beaten egg before folding over and sealing the remaining third. Do this with both strips. Put the remaining beaten egg to one side. 9. At this point you have a choice. You can either bake the two strips as they are or, to approximate an authentic kringle shape, you can join up the ends of each strip carefully to make an oval shape. Either way, place the kringles on lightly greased baking trays, brush lightly with the remaining beaten egg and bake for around 20 minutes, or until the kringle is golden and crispy. 10. Remove from the oven and leave to cool while you make the icing. Place the icing sugar in a small heatproof bowl. Add the butter and the milk and place the bowl over a saucepan half-filled with simmering water over a low heat, making sure the bowl doesn’t touch the water. Stir continuously to combine the ingredients into a smooth paste. Add the cinnamon and stir until combined. Remove from the heat. 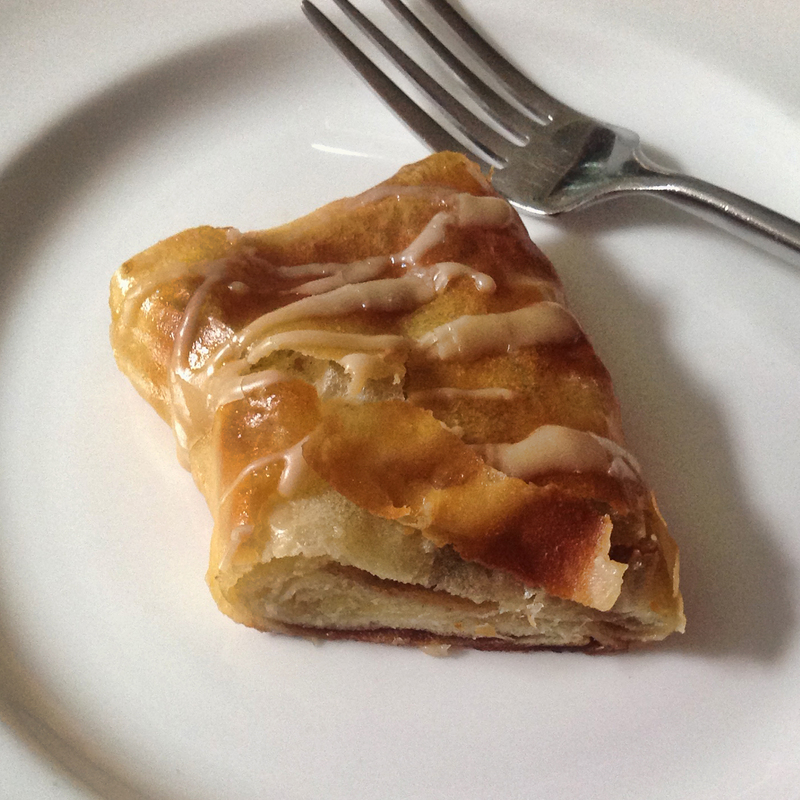 Using a teaspoon, drizzle the cinnamon icing over the kringle in a zig zag pattern. 11. Leave to cool. Serve up slices for breakfast with coffee, Earl Grey tea or whatever takes your fancy. Just make sure you take the time to relax as you eat it, admire your own handiwork and realise that all that time and effort has been worth it! It would be a challenge for me to make the pastry dough but there’s little doubt that your kringle is well-worth the effort. Looks amazing! Being a native Wisconsin girl, I am appalled that I haven’t made Kringle yet. Going to use your filling recipe, as I have a bounty of apples right now for some odd reason…cheers! Thanks for your kind comments. Good luck making the Kringle!